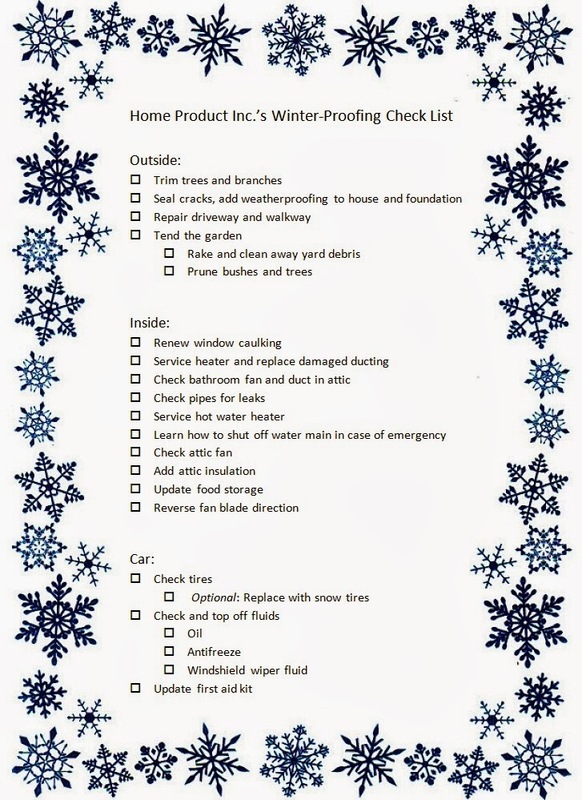 Home Products Inc.: Must-Do Home Winter-Proofing! With just two weeks before Turkey Day, it's time to get those necessary and procrastinated winter chores done before frigid temperatures make that impossible. Accomplishing the things on this list is even more important for those in very cold and snowy areas. With unpredictable and harsh weather, it's very important to make sure that your house and car will be a safe and functional shelter all season long. To make it easier, print this checklist to help get it done! Trim trees and branches- especially those hanging over roofs. High winds and heavy snow could easily break off branches, causing them to crash through the roof or windows. Add sealant and weatherproofing to cracks on house and foundation. Finding cracks and sealing them now will prevent heated air from escaping, raising the heating bill. Also, save some misery of having to trudge through chilly temperatures by finding them now rather than later. Repair driveway and walkways. Existing cracks and chips can easily worsen through the winter months. As water drips down into the cracks and freezes, the water's volume will expand, causing the cement to expand, and crack more. Additionally, de-icers and salt can make this cycle worse, since it causes ice to melt more quickly, allowing it to seep into cracks more. So it's especially important to repair damaged cement if you plan to use an ice melt this season. Tend the garden by raking away debris and pruning bushes and trees. Rather than letting leaves and twigs rot and freeze to the ground all winter long, clean them up now to keep the yard looking clean, and to have easier access to underground pipes in case of emergency. Renew window caulking. Keep in heat and keep out moisture! It's that simple. Service the heater and replace worn out ducting. Test the heater to make sure it works before it's needed. Consider calling a service person to check that it's functioning correctly. Also, go in the crawl space to check out ducts to each room to see if there are any holes that would allow air to escape below the house and replace the ducts with holes. Check pipes for leaks or cracks. Nothing could be worse than a leaky pipe that bursts when it freezes, causing the house to lose water until it's repaired. Don't risk the mess of repairing frozen pipes, and repair any leaks or cracks in them now. Service hot water heater. Instead of having it dysfunction in the middle of a hot shower, have the hot water heater checked over now to make sure it's in top performance mode. Learn how to shut off water. In case of an emergency like a burst or frozen pipe, the water line will need to be shut off. There is always an emergency switch that will allow the homeowner to do this. Find the switch in your house and know where it is in case of emergency. Check attic fan. Attic fans are a great resource to circulate air through the attic to dry out any moisture that may condensate and collect. It also helps prevent all of the warm air from rising and melting snow on the roof, making it run down and freeze above the eaves, making a little ice dam. This dam will prevent other water from running down and off of the roof, and will collect all winter long. Some fans are on a thermometer that will need to be adjusted to run in winter months, and not just run when temperatures are higher. Add extra insulation to the attic. As time goes on, insulation can break down and lose efficiency. Replace insulation in bare areas in order to keep as much heat in the house as possible instead of losing it straight out of the ceiling. Update food storage. Natural disasters and other emergencies are unpredictable, sometimes making it impossible to prepare for them. Have at least a week's worth of food per person saved, along with matches, candles, batteries, lanterns, toiletries, water, and water purification. Cooking stoves that use propane are also a smart thing to carry, allowing food to be cooked and water to be boiled. Don't forget the blankets! For existing food storage, check expiration dates and replace any outdated or spoiled food. Reverse fan blade direction. In the summer, fans should rotate counter-clockwise, pushing air down and cooling the room. In the winter, set fan blades to the reverse direction to rotate clockwise. This creates an updraft, and will pull cooler air up, forcing warmer air back down. To switch the direction, check for a little switch on the fan up by the pull chains and the blades. Check tires. Double check air pressure to ensure tires are at optimum performance, and at a lower risk of bursting. If tread is worn down, replace with new tires to prevent skidding and slippage on ice. For those in icy areas, switch out regular tires for snow tires that will drive better in the snow and eliminate the need for chains. Check fluids. Remember to change the oil every 3,000-5,000 miles! Also, continue to check oil levels between oil changes, and top off low levels. To do this, open the car hood and find the stick labeled "Oil." Pull out the stick, wipe off the oil with a paper towel, and stick it back in. Pull it out once more. If the oil is at or above the notch on the stick, the level is fine. If below, pour more oil in so the level reaches the notch. Also check the antifreeze level, and top off windshield wiper fluid. Update first aid kit. Who knows when an emergency may occur. Keep a first aid kit in the trunk with basic needs, like bandaids, triple antibiotic ointment, painkillers, gloves, gauze, rubber bands, and pins. Update 72-hour kits. Another important emergency essential is a 72-hour kit in the trunk, complete with a change of clothes, shoes, socks, food, water, batteries, flashlights, blankets, and matches. Don't get stranded anywhere in the winter without these! And throw in an extra blanket or two. It never hurts to be extra prepared in a winter emergency.